I love seeing the bees buzzing around my garden. When I see them busily buzzing around from flower to flower then I know I am doing something right by providing them with nectar and pollen to attract them to my garden. The sun came out for a short while today so I sat in a puddle when the drizzling stopped to watch them buzzing from flower to flower in the Rose Bed. The only flowers they seem interested in right now are the Alyssum I planted here. 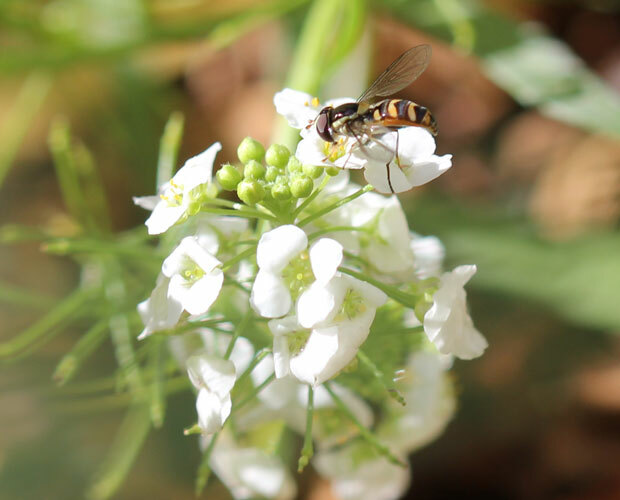 I never realised Alyssum had any fragrance until I sat there waiting to capture at least one photograph of the bees and realised they do smell – quite pretty actually when nothing much else is going on in the garden. It was a lovely half hour spent amongst the flowers and the bees before it started drizzling again and I ran for cover. Oh … and in case you are wondering, I only managed to get one half-way decent photograph of the bee in that half hour. Photography, like gardening, takes practice. But as they say, practise makes perfect. I’ll get there, one day (I hope). If nothing else, I’m learning to be patient! Hi my friend. Your photography is absolutely amazing. Hannes would be really impressed. Have to show him your new great talent!! I know what it’s like when you want THAT shot and it takes time and great patience to get that one photo. You did it. And I am so amazed to see that it’s not an actual bee. Hmmm!! Great photo! You have more patience than I do. I, too, love to see bees and other buzzy things in the garden. Technically, your bee isn’t a bee. It’s a wasp, a pretty aggressive one. We call them yellowjackets here. Great shot! I think you’re a talented photographer! Especially for blogging, where the idea is to report on what’s happening in your garden, how you’re planning for garden changes, lessons you’ve learned, or knowledge you want to convey. Very nice! I love to see bees, bugs, and critters in my garden — but not rabbits. Great picture!!! I always blame my camera on the out-of-focus pics. Oh Cat, praise from you is high praise indeed! YOUR photos are simply stunning – I aspire to take photos as great as yours. I’m so, so far away from that stage, but having fun learning! Hi Jeannine – I’d be totally honoured if you linked to or used my photo! Thank you. I’m still learning – and so much to learn about photography! Great photo! Aren’t you glad it didn’t take a whole hour? That is a pretty nice bee, even if it took a half hour. They are actually hard to shoot because they move around a lot.